I really enjoyed writing In Light of Eternity. It’s a short book, concise, citing many passages of Scripture that give us a cumulatively substantial picture of heaven. I wrote it largely in response to the thousands of letters and questions from readers of my novels Deadline, Dominion and Edge of Eternity. They’ve asked why I portray heaven (and hell) as I do in these books. (In ILOE I cite brief passages from all three of those novels.) In Light of Eternity is full of answers to those reader questions–including what will we do in heaven, will we remember family and friends and events on earth, can those in heaven see what’s happening on earth, will there be animals, what’s the nature of rewards, etc. The Bible tells us much more about heaven than is often assumed. In a day when speculation and subjectivism about heaven runs rampant, I found it refreshing to carefully examine what Scripture says. Readers tell me they’ve given it to those who’ve lost loved ones and those facing death themselves. I’m getting lots of encouraging responses from it, and I’m always interested in reader feedback. If you read ILOE, please email me at info@epm.org and tell me what you think. Thanks! 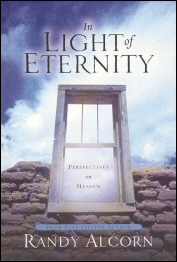 For more information on this subject, see Randy Alcorn’s book In Light of Eternity. This heaven-focused book provided me more earthly applications than I could handle-from what to teach my children and how to spend my money, to what to dream about as I lay my head down at night. If you have questions about Heaven, this is a great way to answer some of them. This book is very easy to read, plain spoken, and easy to understand.